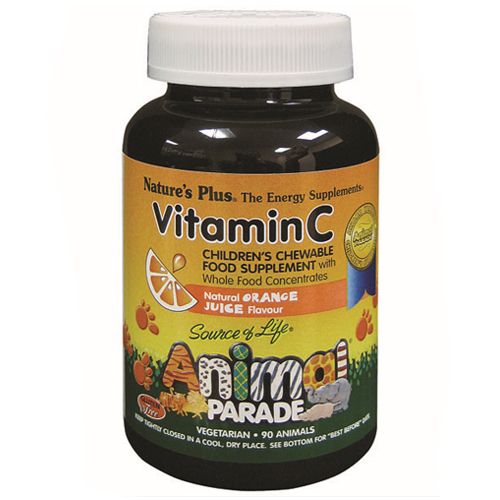 Nature`s Plus Animal Parade Vitamin C is the luscious, orange juice flavoured chewable vitamin C formula made from whole food concentrates! This special Vitamin C blend for children includes citrus-based bioflavonoids, along with grape seed and bilberry extracts and concentrates of mango and papaya. Sucrose, xylitol, natural orange flavour, fructose, vitamin C, lubricant (stearic acid, magnesium stearate), lemon peel, citric acid, C-Source (proprietary whole food complex: grape seed [Vitis vinifera extract], bilberry [Vaccinium myrtillus extract] and concentrates of pineapple, guava, mango and papaya), natural colour (annatto, curcumin, beet juice, non-GMO cane maltodextrin) and anti-caking agent (silica). As a food supplement for children two years of age and older, two chewable tablets once daily. Below are reviews of Nature`s Plus Animal Parade Vitamin C 90 Orange Chewable Tablets by bodykind customers. If you have tried this product we'd love to hear what you think so please leave a review. 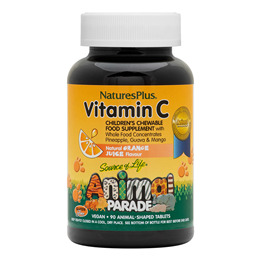 Nature`s Plus Animal Parade Vitamin C is the luscious, orange juice flavoured chewable vitamin C formula made from whole food concentrates!